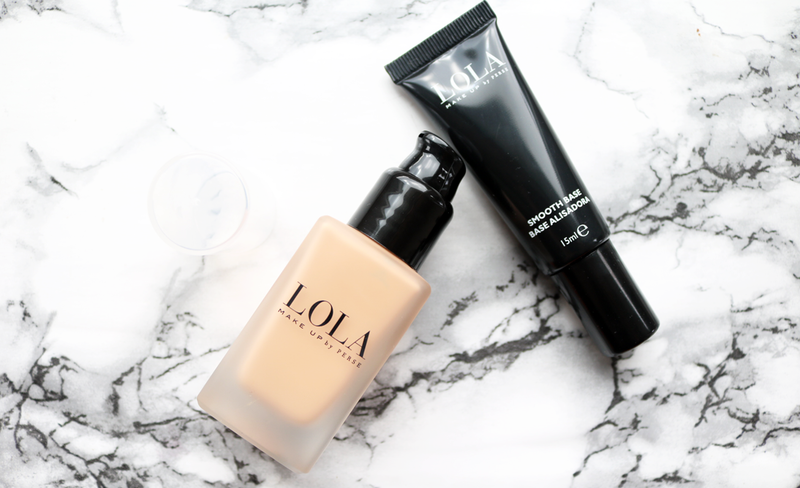 New in my makeup bag this month have been an array of products from British makeup brand, LOLA. Let's have a swatch and play! If you're a fan of M&S' ever expanding beauty departments, you may have spotted a brand called LOLA Makeup by Perse. 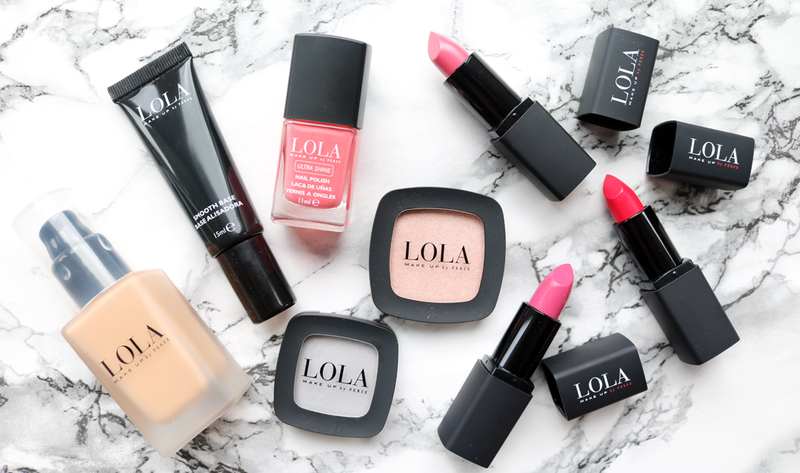 LOLA has been specially designed by a creative team of British make-up artists and beauty experts to give consumers high-quality, cruelty-free products that are just as good as any of the other makeup brands that are used by the pros in the beauty industry. The brand has been on my beauty radar for a while now since I tried some of their fantastic nail polishes, but this is the first time that I've tested out their proper makeup range. The packaging is nice and sleek with heavy glass bottles for their foundations and black rubberized NARS-esque casing for their powders and lipsticks. If you have oily or combination skin like I do, you'll love this primer as it offers a matte finish and helps to reduce the appearance of fine lines and large pores. It has a velvety texture to it, which perfectly preps the skin for makeup by creating a nice smooth base to work on. At first, I was slightly alarmed by the fact that the tube is very small and you only get 15ml of product, but you only need to use the tiniest amount to cover a full face. This primer has managed to keep my makeup in place throughout the recent heatwave that we had over the Bank Holiday weekend, so it gets a thumbs up from me! This foundation looks incredibly luxurious with its satisfyingly heavy and frosted glass packaging, so I was really looking forward to testing it out and I'm pleased to say that it didn't disappoint. LOLA's Picture Perfect Liquid Foundation aims to give you an 'airbrushed and front cover ready' finish and features an innovative pearlescent powder in the formula which helps to hide imperfections by reflecting the light. It's free from parabens and alcohol, and the inbuilt pump is one of the best I've tried as it dispenses just the right amount of product each time. I found that this foundation blended into the skin well with both a Beauty Blender Sponge and a Buffing / Foundation Brush, but it does have a tendency to cling to any dry bits, so make sure that you moisturise or prime your skin properly before applying to get the best results. The finish was lightweight, very natural looking and you can achieve a really good level of light-to-medium coverage without it looking cakey. Does it give me airbrushed skin? Kinda - the light-reflecting tech certainly helps to give the skin a glowy/radiant look, but you will need some extra concealer to completely mask things like dark spots and acne scars. For my skin though, this foundation is really great and I've been enjoying using it - the coverage is just right for me as I prefer a more natural finish and I love how lightweight it feels on the skin. Highlighters fan will love this gorgeous peachy champagne shade that adds an instant glow and really helps to brighten up your complexion. It feels like creamy powder in the pan and applies effortlessly onto the skin, blending like a dream. The formula contains light-reflecting and light-diffusing particles for a natural looking pearlescent sheen. I love this and it's compact enough to pop into your travel bag. 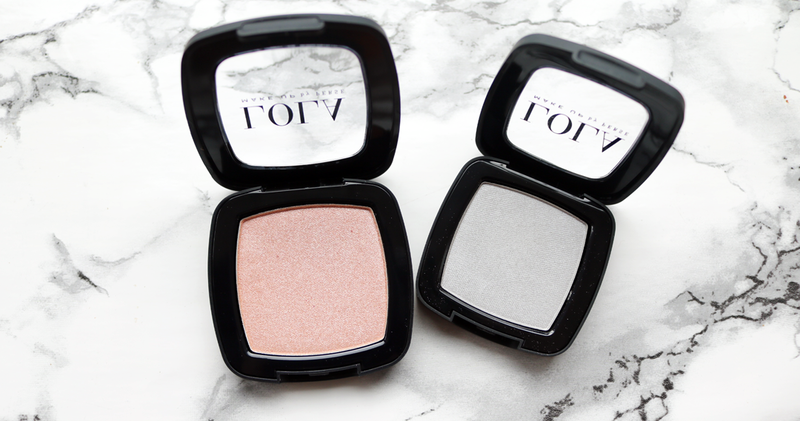 These single eyeshadows are slightly smaller than the highlighters, but they share many of the same qualities. The texture is very similar, as they're silky soft to the touch, blend easily and this shade Pale Grey has a lovely delicate shimmer to it. I'm not the biggest fan of single eyeshadows personally, as I prefer to splash out on a palette instead, but if you love your mono shadows, be sure to check these out as they are great quality. 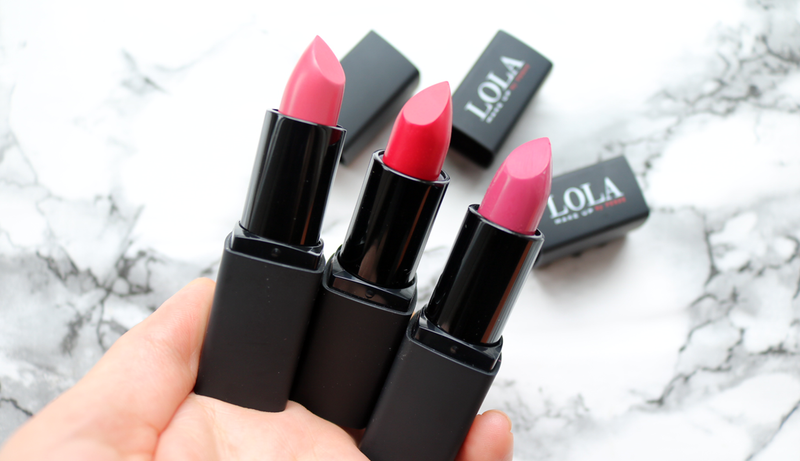 LOLA have a range of lipsticks in different finishes and I've been playing with these three. They all come in sleek black packaging and the shade range is pretty impressive, as are the formulas. The Intense Lipsticks are super pigmented and give you an opaque colour with just one easy swipe on the lips (with the exception of Strawberry Fields which required two coats below), and the Matte Longlasting Lipsticks deliver the same ultra-rich colour but with a semi-matte finish. Best of all though, they feel really comfortable on the lips thanks to a formula of Hyaluronic Acid, Peptides, Antioxidants and Plant Extracts to nourish and plump. Brilliant stuff! The sheerest of the three, Strawberry Fields is light but still offers opaque colour in two coats. This blue-toned, pale pink with a pearlescent shimmer to it, really makes the lips look much plumper! 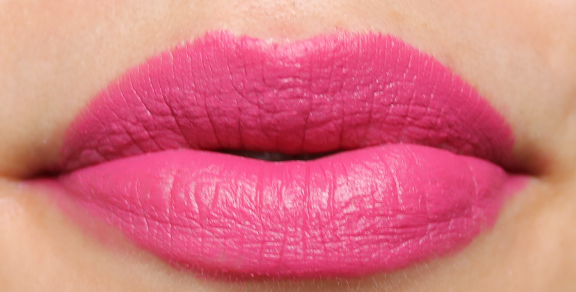 A great everyday shade if you like a subtle shine to your pout without wearing a lipgloss. Pink Martini is one of LOLA's Matte Longlasting Lipsticks and it's a bright hot pink shade that glides on smoothly in just one coat. As mentioned earlier, it doesn't feel drying at all and has a semi-matte finish to it, plus it lasts for a good couple of hours without smudging or transferring. If you're after a new red lippie, try this one! Raspberry Red is a sizzling hot, pink-toned red which tends to suit me more than most straight-up reds. It's intensely rich and pigmented and gives you full coverage colour with one easy coat. When you're shopping at the LOLA stand, make sure you don't skip pass their Ultra Shine Nail Polishes because they are really good and not to be missed. I have a couple of shades in my collection and all of them have fantastic formulas with a mega-glossy finish. I'm currently loving this shade called Prom Queen which is a gorgeous pinky coral - looks pretty on toes too! Have you tried anything from LOLA Makeup by Perse?